The contribution of Jaina art to the mainstream art in India has been considerable. Every phase of Indian art in India has been considerable. Every phase of Indian art is represented by a Jaina version and each one of them is worthy of meticulous study and understanding. Jaina architecture cannot be accredited with a style of its own, for in the first place, it was almost an offshoot of Hindu and Buddhist styles. In the initial years, many Jaina Temples were made adjoining the Buddhist temples following the Buddhist rock-cut style. Initially these temples were mainly carved out of rock faces and the use of bricks was almost negligible, however, in later years, the Jaina started building temple cities on hills based on the concept of mountains of immortality. 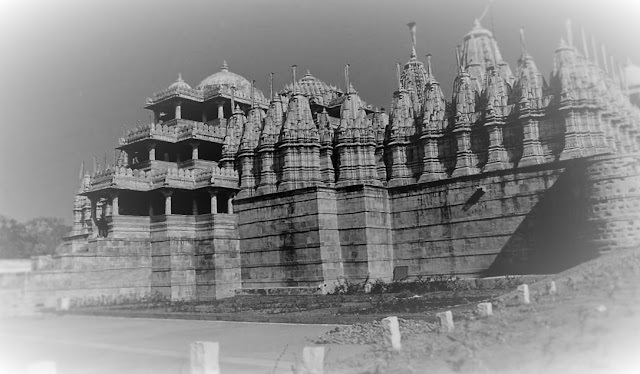 • Compared to the number of Hindu temples in India, Jaina temples are a few and spaced out. Surrounded by embattled walls, the temples are divided into wards, guarded by massive bastions at its ends, with fortified gateways as the main entrances. • These Temple-cities were not built on a specific plan instead they were the results of sporadic construction. • Natural levels of the hills, on which the city was being built, were the results of sporadic construction. • The only variation in these temples was in the form of frequent chamukhs or four-faced temples. In these, the image of a Tirthankara faces the four sides, or four tirthankaras are placed back to back to face the four cardinal points. • Entry into this temple is also from the four doors. The Chamukh temple of Adi Nath(AD 1618) is a characteristic example of the four-door temple. • The great Jaina temples and sculptured monuments of Karnataka, Maharashtra and Rajasthan are world renowned. • The most spectacular of all the Jaina temples are found at Ranakpur and Mount Abu in Rajasthan; Deogarh (Lalitpur, Utter Pradesh), Ellora,Badami and Aihole also have some of the important specimens of Jaina Art. The Rajputs were great patrons of art and architecture, the finest examples being their forts and palaces. The Rajput Palaces are complex compositions built as inner citadels surrounded by the city and enclosed by a fortified wall as at Chittorgarh and Jaisalmer. Some forts, such as those at Bharatpur and Deeg, were protected by wide moats. 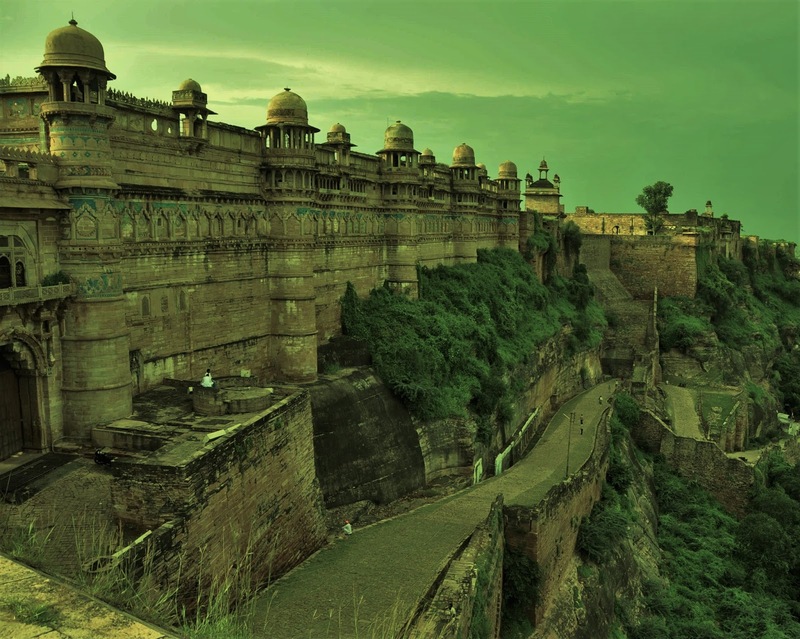 • The oldest surviving palaces date from the mid 15th century and are found at Chittor and Gwalior. • The Man Mandir, The Largest Palace in Gwalior, was built by Raja Man Singh Tomar (1486-1516). The Man Mandir has two storeys above and two below, ground level overhanging a sandstone cliff. This gigantic cliff is punctuated by five massive round towers, crowned by domed Cupolas and liked by delicately carved parapets. The whole façade is enriched with brilliant blue tiles. • The palaces of Jaisalmer, Bikaner, Jodhpur, Udaipur and Kota represent the maturity of the Rajput style. All of these Palaces were built predominantly in the 17th and early 18th centuries. • The huge fortified city of Jaisalmer is situated far out in the Thar Desert. The buildings are constructed with the local yellow-brown stone and they have been remarkably preserved owing to their remote locations. • The city of Bikaner is encircled by 5.63 km long stone wall in rich pink sandstone. There are five gates and three sally ports. The Jodhpur Fort dominates the city, which is surrounded by a huge wall with 101 bastions, nearly 9.5 km long. • The Foundation of Jaipur, the fabled pink city in AD 1727, represents the final phase of the Rajput architecture. Built by Jai Singh, Jaipur represents a fusion of Eastern and Western ideas of town planning. • The City is enclosed by a wall and has bastions and towers at regular intervals. The city Palace is at the center of the walled city and is spectacular synthesis of Rajput and Mughal architecture styles. • The famous building Hawa Mahal or A Palace of Winds, (1799), which has a five-storeyed symmetrical facades composed of 953 small casements in a huge curve, each with a projecting balcony and crowning arch. • The Jantar Mantar, the largest of five observatories built by Jai Singh II in the early 18th century, is another interesting example of Rajput Architecture.